Regular readers know that I usually review a wave of DC Universe Classics in two parts - three figures in one, three figures and a BAF in the other. The newest wave, series 19, is now hitting Targets, but more in dribbles than in any kind of real quantity. I have only found two of the six so far, and that was several weeks ago. Rather than continue to wait to find any more, I figured it was time to hit these up and move on. The two I found are Magog and Hawkman, and each has a piece of the S.T.R.I.P.E. Collect and Connect figure. Once I manage to snag the rest of the wave (which includes Sandman, Star Girl, the Atom, and a Modern Kobra) I'll do them all up, but I'm assuming I'll do it in three parts this time around rather than just two. These are getting mighty expensive, running around $15 - $18 each depending on the retailer right now. If you've bought anything from Matty Collector lately, you'll have received a $5 off coupon with your shipment, and I highly suggest taking advantage of it. I'm going to assume we all know who Hawkman is - you better, or you can just tern your nerd card now. 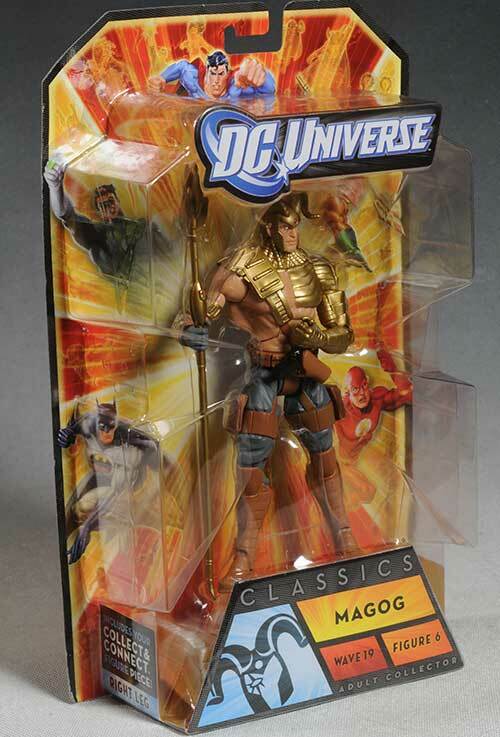 But Magog might be a different story, since unlike Hawkman, he's a relatively new 'classic'. 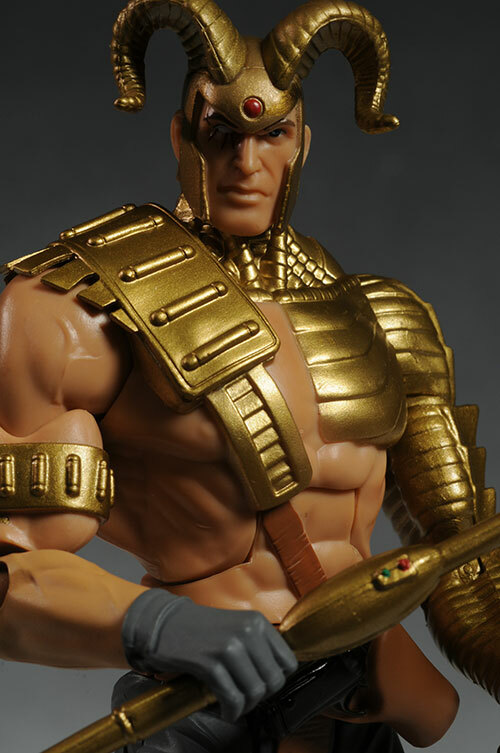 He first appeared in Kingdom Come back in 1996, and his design was originally intended to be the essence of all that was bad about 1990's comic book art. And yet, the design hit a chord and the character ended up being quite successful. Even with the weird mish-mash of elements, I have to admit to really liking the look myself. The packaging is the usual, with just a few rubber bands and no twisties. It's not collector friendly of course, but it does the job, and the full set is shown on the back of the card, along with the Collect and Connect figure. Both of these figures are terrific looking, with complex uniforms and sharply defined sculpts. 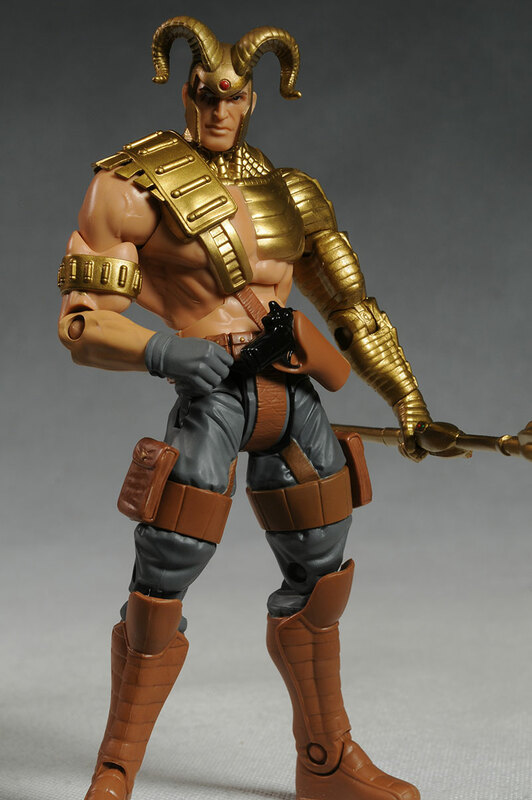 I love the armor and scale on Magog, and he's not even a character I'm all that fond of. The horned helmet looks great, and the belt and handgun add a cool factor. 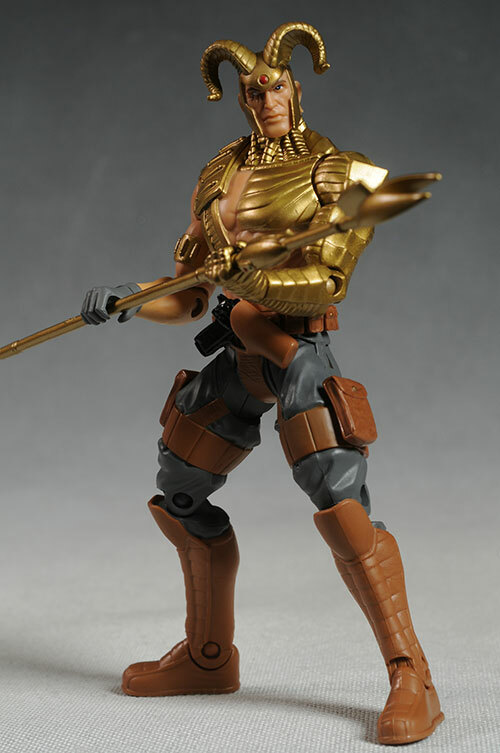 Unfortunately, the gun is sculpted as part of the holster, so he can't actually draw it, but it still looks terrific. 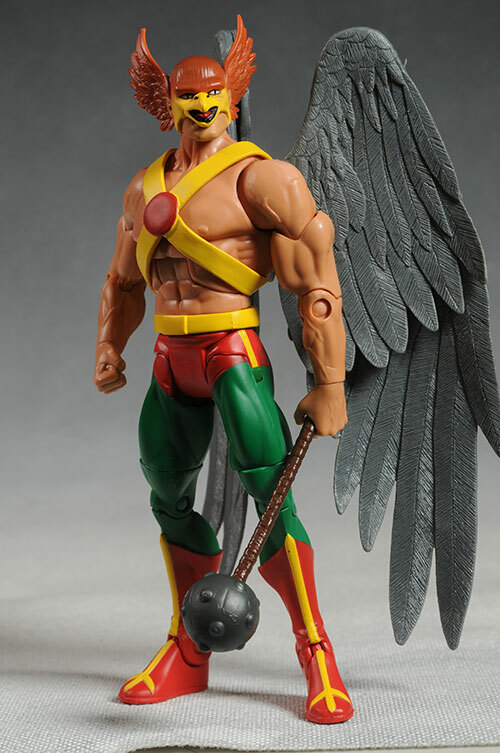 The wings on Hawkman are huge and finely feathered, and he can maintain an upright position even with them spread. He takes a hit though, and scores slightly lower than Magog, for two minor issues. First, I'm not a huge fan of the chicken beak mask. I know it's accurate, which is why I'm not deducting too much - but it's goofy looking. I'm also hitting him up slightly for the hand sculpts. While Magog has two grasping hands, Hawkman has only one - his left. The right is a solid fist, reducing the options with the included mace. These are both on the large size for the 6" scale DC Universe Classics, but that fits with the characters. They stand great on their own, even in deep stances. The paint work on both figures is quite clean, although it's a little light on the details. 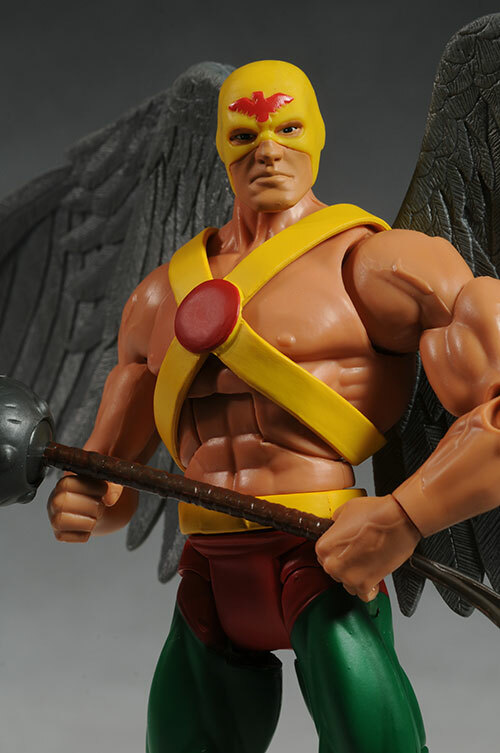 The gold armor looks great on Magog, and the tough red and yellow on Hawkman are fairly clean. There's a fuzzy cut line here and there, but considering how tough these two colors can be, it's not bad. The eyes are clean on all three head sculpts, but there's not a ton of small details on the costume and body. Even the wings, which have very finely sculpted feathers, aren't painted in such a way as to bring out that detail work. Both figures have the usual excellent DCUC articulation. From ball jointed shoulders to pin ankles, all the joints you expect are here. Most have an excellent range of movement too, including the ball jointed necks. Both can tilt and turn, and this adds plenty of personality to any pose. The joints are tighter than usual, but I didn't have any trouble breaking them free. The pins are solid and high quality, with little chance of breakage. They're a little light in this category, but what's here makes sense. 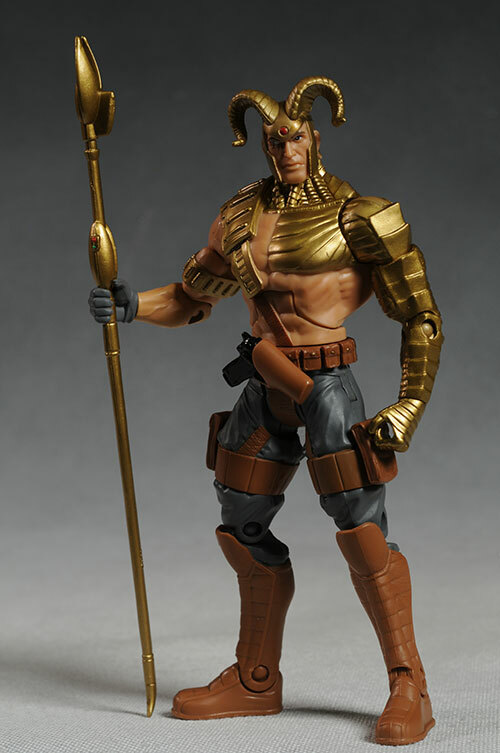 Magog has his funky Stargate-like staff, which fits nicely in either or both hands. That's it though - a tad light as I said. I was expecting the gun to be another accessory, but it's sculpted into the holster. 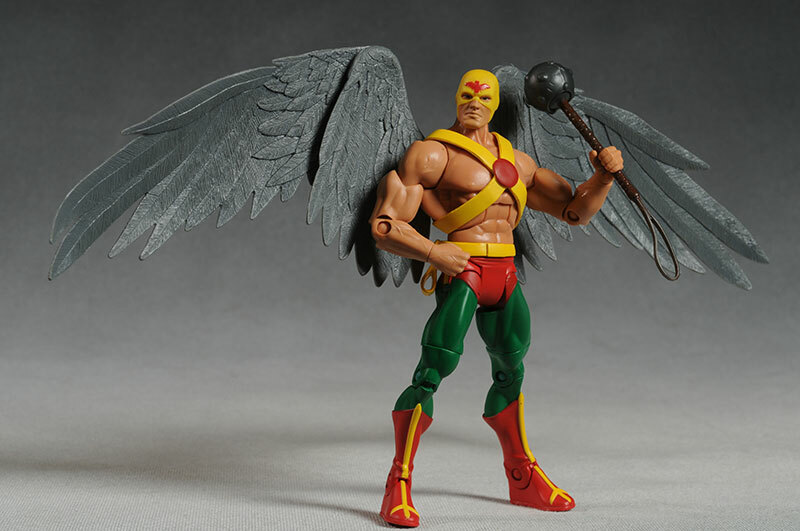 Hawkman does a bit better, with both his traditional mace and a second head sculpt. The second one is more 'normal' in appearance, lacking the more bird-like helmet, but also a bit less 'classic'. The heads swap pretty easily, and both work well with the ball jointed neck. Kids will enjoy both of these figures, even if they don't know who the characters are. Magog has the cool armor and horns going for him, and Hawkman has the wings - what more could an eight year old ask for? Of course, the great articulation, sculpt and paint all help. Fifteen bucks I could live with, but with the prices of DCUC figures getting closer to $20 every day, I'm having a tough time calling them a decent value. While these two have a few issues here and there, I have to say that both really impressed me. 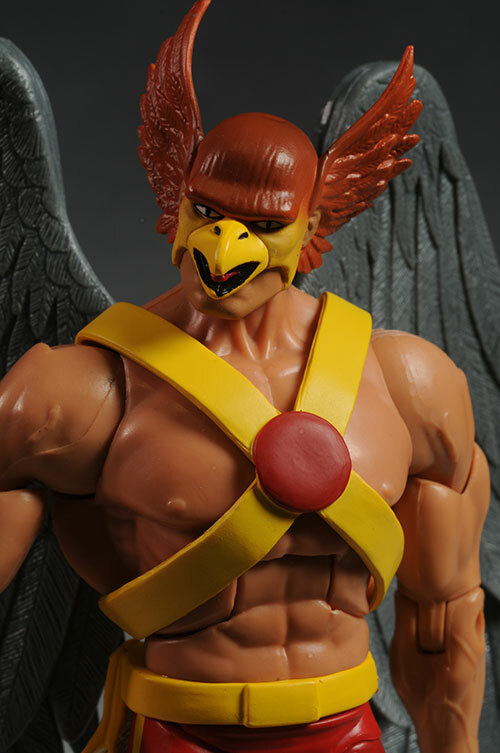 The chicken beak is a bit goofy, but Hawkman's wings and extra head sculpt make up for it, and Magog is just cool all the way around. These two are both winners, and I can't wait to get my hands on the rest of the wave. - has the singles for $18, and the set for $100. - Entertainment Earth has a case for $135, the set for $100, or the singles for $18. - most recent were the series 17 part 1 and part 2, as well as series 18 part 1 and part 2. - other recent reviews covered the new Green Lantern waves: wave 2 part 2 and part 1, and wave 1 part 2 and part 1. - Series 16 was split up too, into part 1 and part 2. - I finished off wave 15 in two parts, one here and one here. - and wave 14 was also in part 1 and part 2. - the SDCC Plastic Man was the previous review. - I split the wave 13 up into two sections, part 1 and part 2. I've covered just about every wave since the beginning too, and you should also hit the Search Reviews page to find them, or in case any other applicable reviews were done after this one was published.